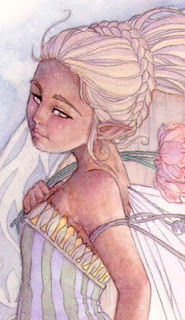 One thing I have noticed in many watercolor paintings, other than my own, are the colors used for skin tones. Everyone has their own way of portraying skin. Some with browns for all ethnic groups, some pinks, some peaches, some multiple colors that you wouldn't even think of using for skin. When I started I thought about how I wanted it to look. I loved the old classical oil paintings, and the glow they gave off. How soft they looked. After many tries, I came to my own way that I don't see much in others' work. I encourage the same for you. My fairy has gone a different direction once again than I anticipated. After looking at my portfolio I realized there were very few women of color. I LOVE illustrating women of color, but apparently I do more in pencil than paint. Probably because it's faster. The steps using Rose Doré and the purples for shadows work for any ethnicity, from there you can choose Asian, African, Indian, Caucasian, etc. Some take a bit more work, and a woman of color is one of them. The first step is I prepped my color. I mixed water into my Burnt Umber, cleaned my brush, then mixed water into my Cobalt Blue. After choose a place on my palette that was clean, I moved my Burnt Umber over, a bit more than I think I would need as far as enough paint to do all of the skin. I then grabbed a little bit of the Cobalt Blue and mixed it into the Burnt Umber I set aside. I knew I wanted a brown, but wanted it to be a bit darker than what I had on my palette. And Sepia was just way too dark for me. I mixed enough water into my mix so it was roughly one part paint, one part water. Then gently I coated all of my skin with the mix, pulling any extra around instead of constantly adding more. I say gently because I didn't wanted to disturb the layers I already had. Don't judge quite yet. After the Burnt Umber mix dried I then returned with Alizarin Crimson and brought back my reds (following the Rose Doré laid before). Same technique and everything. Once that dried, which since I started at the head and work down, by the time I got to the feet the face was already dry, I brought my shadows back using the Cobalt Blue. Violet, to me, would be too dark and drastic. I do this over and over again until I reach the reds and the shadows to where I feel most comfortable or appropriate for the piece. Tip: Again, don't judge your work yet. The hair will throw you off, the eyes, eyebrows, etc. Everything will look wrong at first. Even some of the colors may seem wrong. Underpainting always looks a bit off, but it's necessary, and again, to me, it just makes sense in watercolor. Once all of my layers were 100% dry (very important! ), I wanted to bring the brown tone up more. I just didn't feel she was dark enough. So by this time my Burnt Umber and Cobalt mix has dried off a bit. This is perfect because I wanted it to be more saturated than watered down. I didn't go over the whole skin surface this time, instead I brought out my shadows more deeply by adding the mix and blending out. 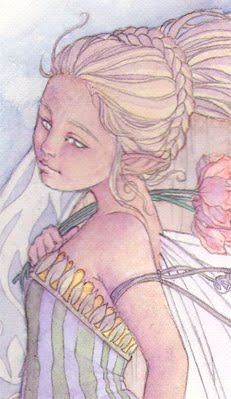 Once I was finished with that I let it dry (which only took a few moments) and went back in with the Rose Doré. Are you sensing a pattern here? I only added the Rose Doré where it needed to appear more fleshy. For example the cheeks, fingers, nose, elbow, ear, etc. If you're unsure about where those areas are, go take a look in the mirror. It's all the same no matter where you're from. Finally, I added the highlight. If my light is warm, like it is here, I always add Yellow Ochre. I love the softness and overall glow it gives up against the blues and purples. Remember? Compliment colors bring out each other. My Yellow Ochre is very watered down. I like to have control as to how much is showing. If it's not enough then I can always go back in. But that wasn't the case here. Too yellow might make the Cobalt blue look green. And I wouldn't want that! Tip: Don't be afraid if your painting isn't going the direction you wanted. It has a "life" of it's own, and to fight it usually tends to something you'll dislike much more. Just go with it. Next: H A I R!